The standout newspaper in this collection is undoubtedly the Irish American. For more information about this title, and all other New York City Irish newspapers, consult Chapter 3 of my book, Finding Your Irish Ancestors in New York City. You can access the complete list of GenealogyBank newspapers by clicking here. It can be more difficult to find substantial and useful sources for the study of Irish genealogy in the United States the further west one is from the east coast. 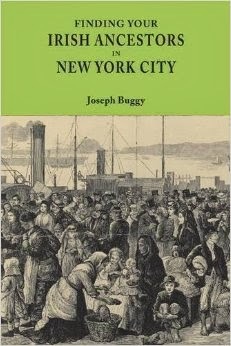 The vast majority of Irish immigrants stayed in states such as New York, Massachusetts, New Jersey, and Pennsylvania. Nevertheless, many did travel to the midwest and beyond, where records about their lives were made and books written about their communities. For those who are researching their Irish ancestry in Kansas, the state historical society provides a very useful online bibliography of sources, reproduced below, to aid such research. You can access the relevant webpage of the Kansas Historical Society by clicking here. Butler, Thomas A. The State of Kansas and Irish Immigration. Dublin, Ireland: McGlashan and Gill, 1871. (K/325.1/Pam.v.1). In 2003, the town of Achill in Co. Mayo was twinned with the city of Cleveland, Ohio. The reason for this twinning was due to the considerable number of Achill emigrants who settled in the city over the last 150 years. A great example of this connection is seen in the Lavelle Family From Achill to Cleveland website. Lavelle is one of those wonderful rare Irish names and can be tied to a particular part of Ireland. MacLysaght's The Surnames of Ireland outlines that it "is the name of a north Connacht sept, also found in Donegal." Indeed, the website has documented 44 different Lavelle families who settled in Cleveland from Achill. Estimates vary as to how many Clevelanders have Achill ancestry with anything from 25% to 80% claiming such links. However, I have not been able to find cited documentation to support these numbers. Do you have Irish ancestors in the Cleveland area and are looking for their place of origin? Chances are, they were from Achill. MccLysaght, Edward. The Surnames of Ireland. Dublin: Irish Academic Press. p. 190. Author Unknown. History of the Twinning of Cleveland, Ohio and the Parish of Achill, County Mayo, Ireland. Year Unknown http://ead.ohiolink.edu/xtf-ead/view?docId=ead/OCLWHi0286.xml;chunk.id=bioghist_1;brand=default: accessed 6 January 2015. Many states, cities, and towns have a seminal publication about the Irish community that lives there. In Cleveland, Ohio it is The Irish Americans And Their Communities of Cleveland. The book was published in 1978 and written by Nelson Callahan and William Hickey. The book begins with a brief overview of Irish history and Irish immigration to North America, before focusing on the Irish immigrants who came to Cleveland. Chapter 3, Settling in Cleveland, forms the core of the first section and follows a broadly chronological path through the 19th century. Beginning with those who first came in the 1820s, it moves on to those who lived on Whiskey Island and in Irishtown, focusing on such topics as employment, crime, the Civil War, and politics along the way. The Catholic Church is a central theme that runs through the second half of the book. As in many other urban areas, it played a defining role in the lives of 19th century Irish immigrants who moved to the growing American cities. Readers will learn about the parishes and cemeteries in the city, which can lead to useful genealogical information. There are also maps, photographs, and information about Cleveland Irish organizations as they existed when the book was published. While not aimed at genealogists, the book will be valuable to those who have ancestors in the city. Luckily it is available to read for free on the Cleveland Memory website, click here to access. I came across this interesting set of maps on the National Historic Geographical Information System website (NHGIS). NHGIS provides free online access to summary statistics and GIS boundary files for U.S. censuses and other nationwide surveys from 1790 through the present. There are different sample maps to view, one of which is a set of maps for three U.S. cities, created from 1930 federal census data. 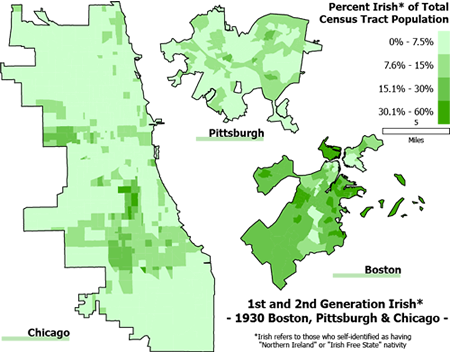 The maps show the distribution of first and second generation Irish immigrants in the cities of Boston, Chicago, and Pittsburgh. There can sometimes be ambiguity as to whether a first generation immigrant is the foreign-born person who immigrated or their native-born children. Social science researchers and demographers mostly refer to the first generation as those who are foreign-born and immigrated to the U.S. Unfortunately the detail is not of the highest quality on the maps and there are no sub-boundaries for the cities. However, they can be useful when used with more detail maps of the cities. They indicate areas with high concentrations of Irish-born people and their children, and can be useful as a starting point to work out where an immigrant might have lived upon arrival, if not already known. The thinking being that a new immigrant is more likely to first stay in an area with a lot of Irish people. You can see this and other non-Irish maps on the NHGIS website by clicking here. Note: as you can probably make out on the maps, the definition of Irish for this map includes those born in the then Free State and Northern Ireland. The Western Reserve Historical Society (WRHS) is the oldest cultural institution in Cleveland, Ohio and its efforts concentrate on the history of northeastern Ohio. It does this in many ways, such as with their large number of significant collections focusing of different ethnic groups, one of which is the Irish. Their "Irish American History Archives....collects, preserves, and makes available for research the papers and photographs of the Cleveland Irish community and the historical records of Irish organizations and institutions in northeast Ohio. Materials relating to politics, religion, culture, business, labor, genealogy, education, fraternal organizations, charities, and individual life experiences are the key to the understanding of the Irish experience in greater Cleveland." 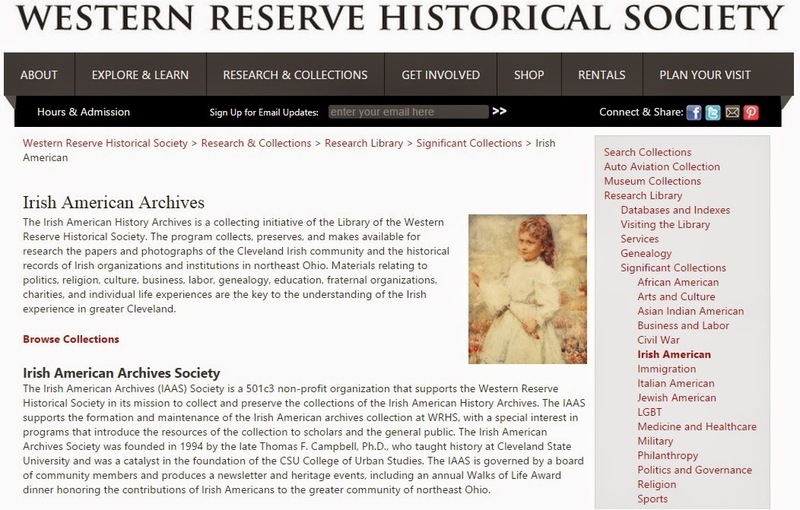 The WRHS Irish American History Archives is maintained in partnership with the Irish American Archives Society, a Cleveland based non-profit organization. The collection is wide ranging and consists of books, manuscripts, newspapers, periodicals, photographs, and other items. A considerable number of genealogy books are included, making it a good place to conduct research if you live in northern Ohio or western Pennsylvania. The family papers of many Cleveland area Irish families are housed here and contain genealogies, photographs, and other useful information. One final example of the use of this collections is the considerable number of organizations that have their records housed as WRHS, including the Burke School of Irish Dance, McGorray Brothers Funeral Home, and the superbly named Knights of Equity, an Irish Catholic social group, first established in 1895. Click here to access the website of the WRHS Irish American Archives. The Western Reserve Historical Society is located at 10825 East Boulevard, Cleveland, Ohio 44106. Western Reserve Historical Society. Irish American Archives. Year Unknown. Available at http://www.wrhs.org/research/library/significant-collections/irish-american: accessed 31 December 2014. Access these records by clicking here. Access the Digital Library of Georgia website by click here.